The Power of Connections - A Mentee's Perspective - The Junior League of Boston, Inc.
Editor’s Note: We recently posted a discussion by the Executive Director of Strong Women Strong Girls about thier partnership with the Junior League of Boston. Today we hear from a college student in the SWSG program who is mentored by a Junior League member and who then uses her leadership skills to mentor a grade school student. Eni with mentor, Nia, in action! Strong Women, Strong Girls is a collective organization. The girls, college students, Site Monitors, event volunteers, and Professional Mentors come together to make this well-oiled machine that produces the most amazing connections among people from all different backgrounds. And while all the connections made are meaningful, the one between the college student and Professional Mentor is particularly significant because of the advice and guidance provided by the working woman to those of us figuring out what we want to do with our lives. 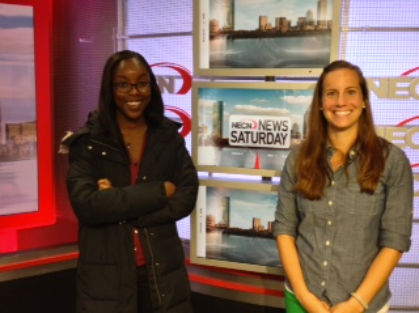 As a Communication and Media Studies Minor and avid enthusiast of all things news, I was incredibly thrilled to discover that my Professional Mentor, Nia Green, was a Television Producer for New England Cable News, a Boston-area news station. For the better portion of my life, I’ve known that I want my future to involve a career in the broadcast journalism industry, so one could very much gauge my level of excitement after this outstanding revelation. And despite both of our hectic schedules, we have been able to meet up numerous times throughout my semester, strengthening this growing relationship. Out of all of our meetings, my favorite has to be my visit to the NECN studio in Newton, Massachusetts. Because of her position as a News Producer, Nia was able to give me a behind the scenes tour of what occurs on a day-to-day basis at the studio. I met some broadcasters, the weatherman, and countless others who work to produce shows every hour of the day. I was even allowed to stay in the producer’s control room during a live show, completely solidifying my love for this industry. It is safe to say that signing up for SWSG was one of the best decisions of my life. Because of SWSG, I have been able to meet some incredibly empowering and fascinating females of all ages including Nia, who has gone above and beyond to support me as a mentor and as a student interested in broadcast journalism. Strong Women, Strong Girls has built a very large community that continues to encourage and care for me every single day. Eni Akintade is a current sophomore at Tufts University majoring in International Relations and minoring in Communication and Media Studies. She joined the Strong Women, Strong Girls community as a freshman, and now assumes a fundraising position on the SWSG e-board at her university. She has mentored at Prospect Hill Academy in Cambridge and Elizabeth Peabody House in Somerville.